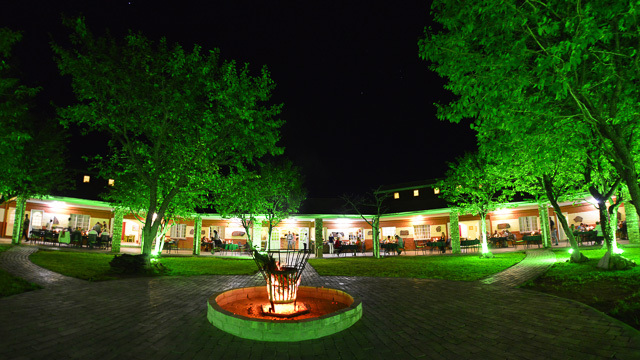 As you enter the lodge grounds you'll see a large covered veranda running the full length of the main building forming a courtyard with Mopane trees and a boma area in the middle. 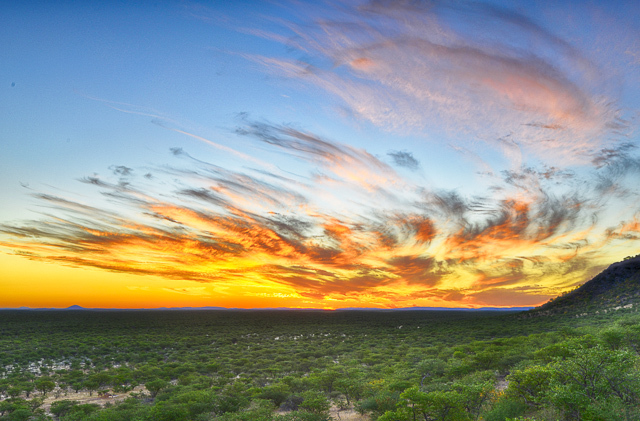 The lodge lies in a valley surrounded by large hills and mountains. 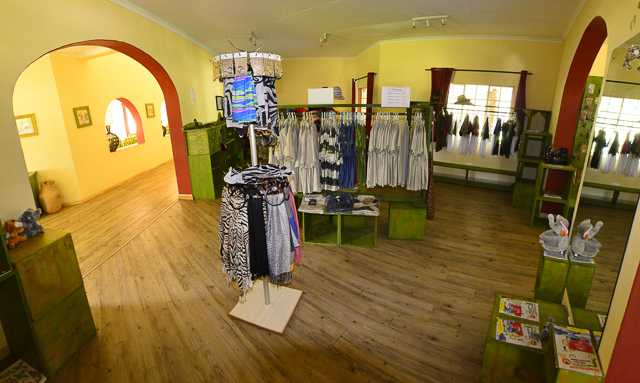 The main entrance opens to the reception area which is in the middle with a large curio shop surrounding the reception. 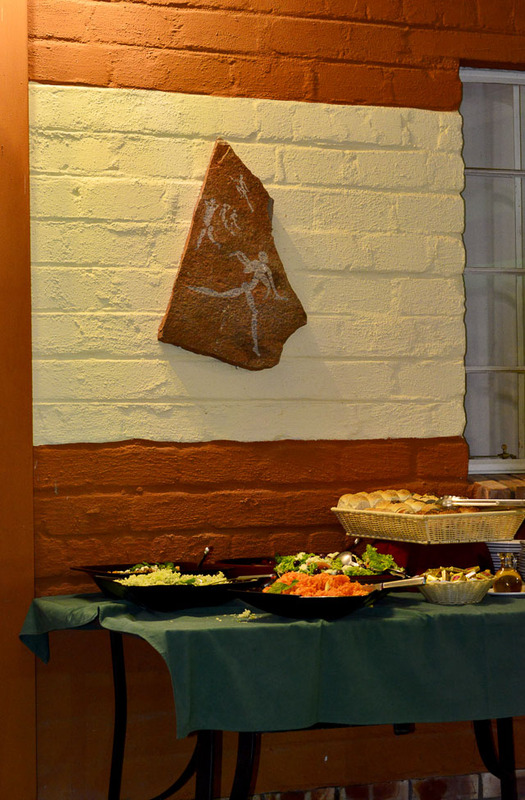 A bar area is open on both sides of the main building and just along a passageway you will find the dining area. 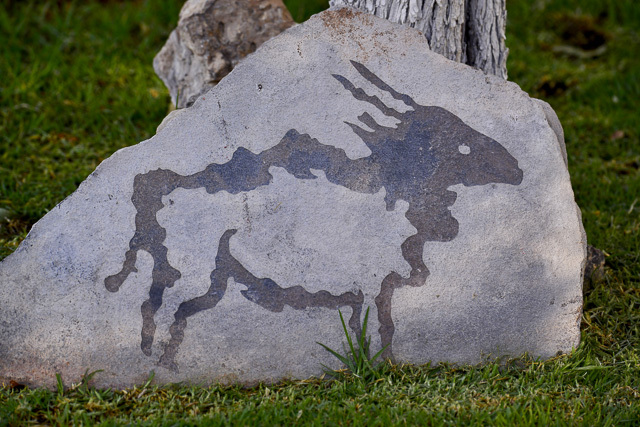 Rock engravings and wonderful pictures of the surrounding areas adorn the walls and garden of the lodge, giving you a feel of Twyfelfontein and Damaraland. The open bar area serves the outside covered veranda and dining area as well as the pool side veranda where you can order a light lunch for an a-la-carte menu. 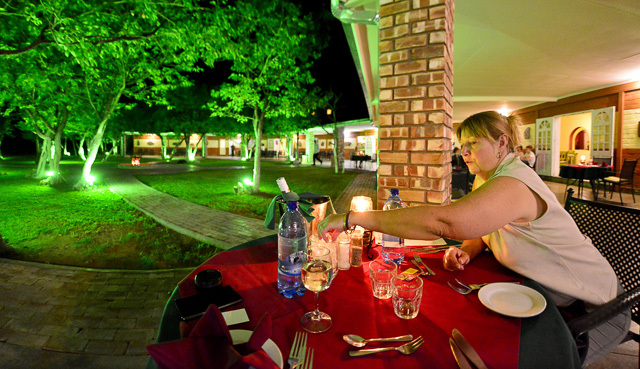 Dinners were outside near the boma overlooking the courtyard. 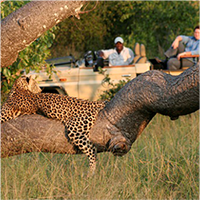 Dinner and breakfast are buffet style and dinner is served on the veranda when the weather is warm and breakfast is served inside. 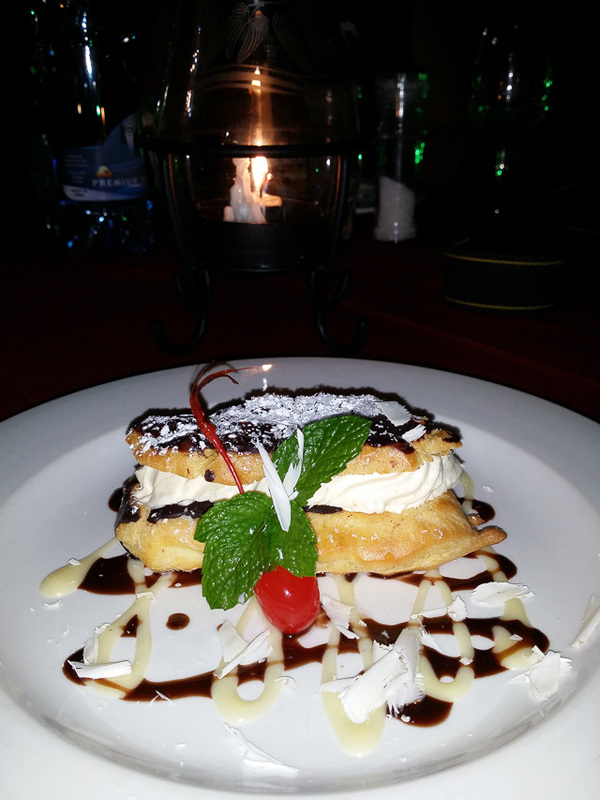 For dinner, starters and desert are brought to your table while the main meal is served at the buffet. 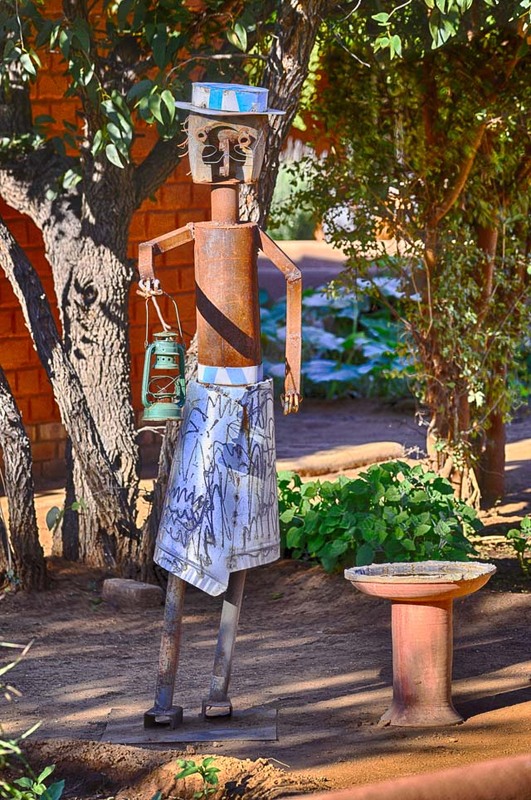 We had some lovely meals during our three day stay; everything was fresh from their veggie gardens which also provide fresh ingredients for Etosha Safari Lodge and Etosha Safari Camp. 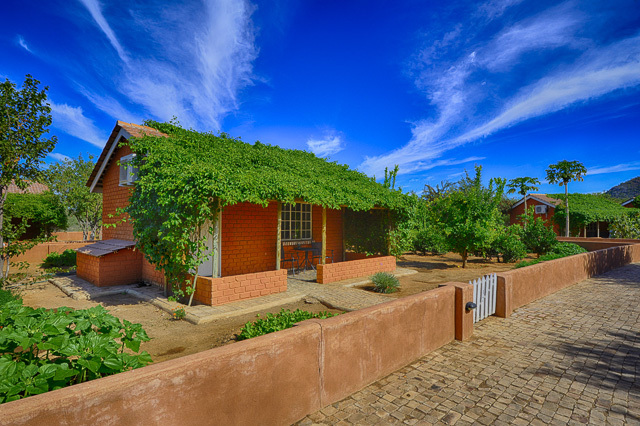 A network of paved pathways lead from the main building, which lies in the centre of the lodge to the 55 chalets each having their own fruit trees, vegetables or herb gardens. 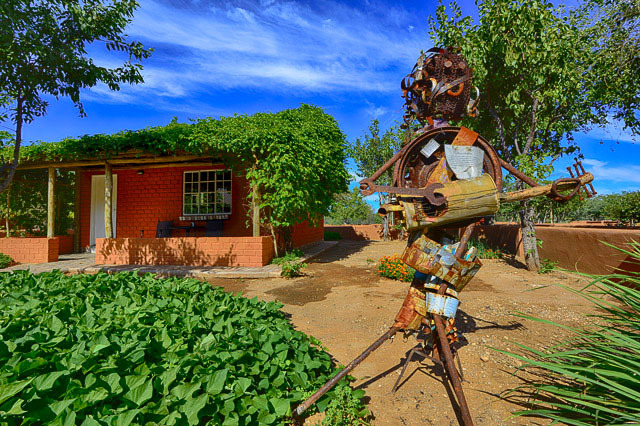 The walled gardens give you a feeling of staying in a small village; it is such a lovely atmosphere, with unusual scarecrows or some other interesting feature in each garden. 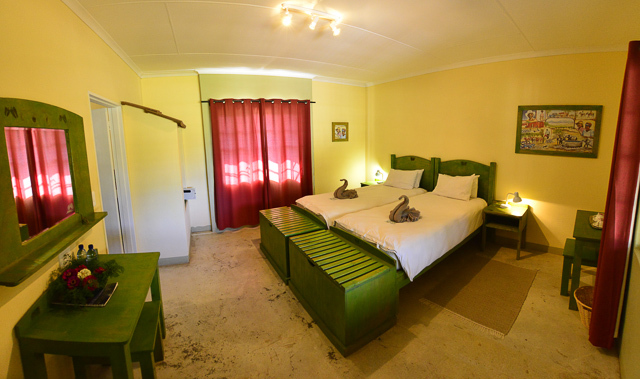 The chalets all have en-suite bathrooms, air conditioner, tea and coffee station and a small safe. 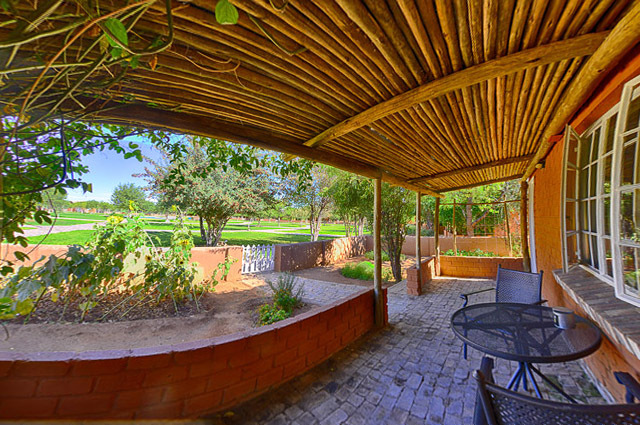 A large veranda with table and chairs allows you to relax and enjoy the wonderful bird life or the views of the gardens. 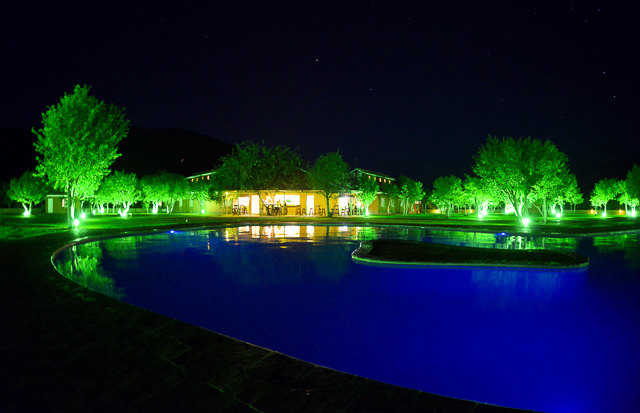 Relax around the swimming pool on the lush green lawns under the shade of the many mopane trees. 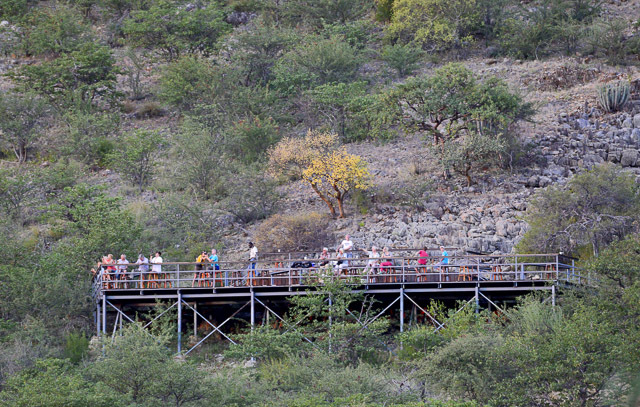 Or take a walk up the hill to watch the sunset at the wooden viewing deck….it is quite a climb and not for the faint-hearted, but you will be rewarded by the magnificent view. Drinks and a few snacks are served up here during sunset. 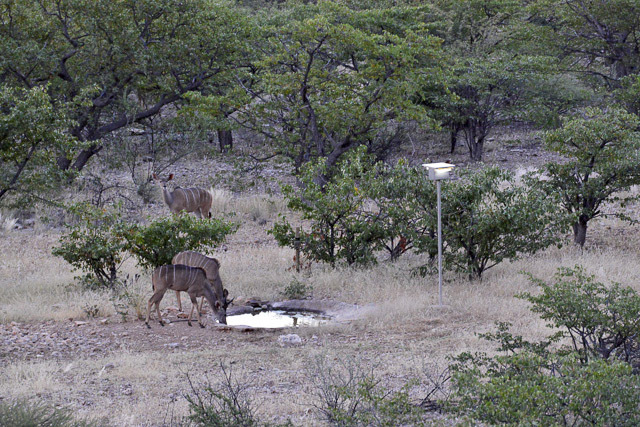 You will be able to view the flood lit waterhole from the viewing deck and you may even get to see some animals drinking like we did as we watched Kudu come down to the waterhole. 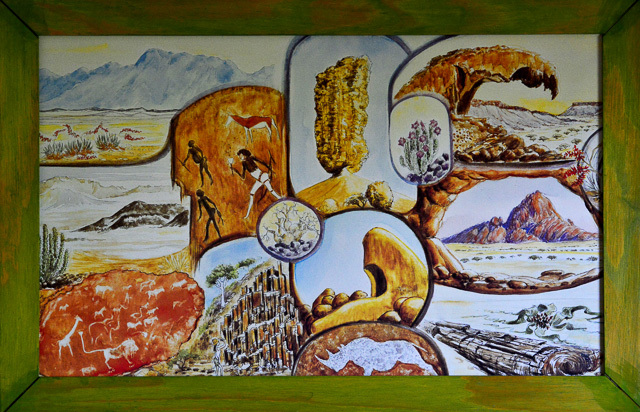 Take a drive to the many fascinating sites in the area; Vingerklip rock, Twyfelfontein, Organ Pipes and the Petrified Forest and look out for the elusive Desert Elephants and other animals along the way. 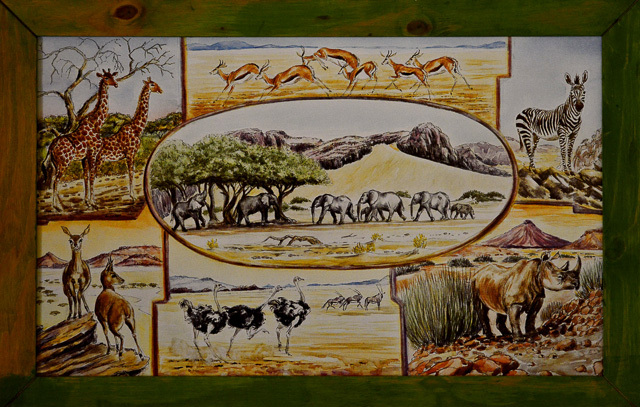 Another wonderful stay at one of the Gondwana Collection lodges with friendly staff and great food! 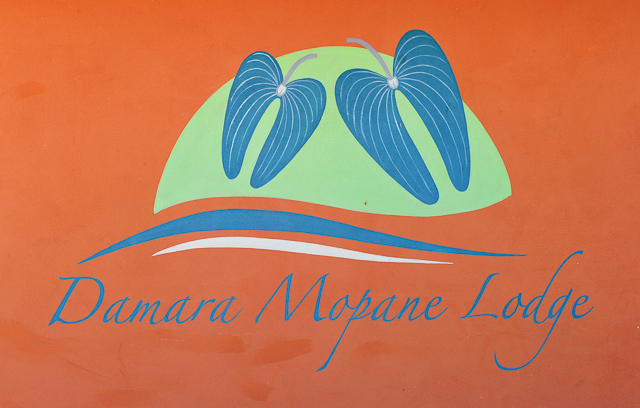 For more information on Damara Mopane Lodge or to make your booking please click here. 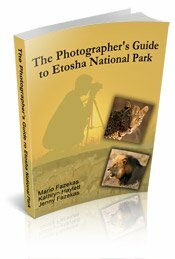 "I highly recommend the book to anyone visiting Etosha National Park to photograph the animals - or anyone considering an African photography safari in the future." 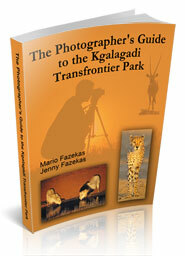 "If you’ll soon be boarding a plane and heading off to Namibia, don’t leave home without this eBook!" 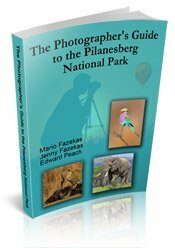 "Overall it is a great book that I highly recommend."